Changes to UK immigration rules will give greater flexibility to business visitors and businesses sponsoring international migrants, ministers say. Visitors to the UK will also be allowed a short period of study or training as part of their stay. Multinational firms will be able to bring their own auditors to the UK on a business visitor visa. 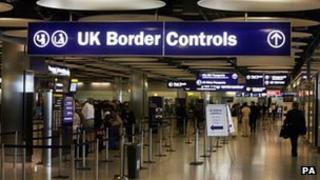 Immigration Minister Mark Harper said the changes were designed to show the UK was "open for business". Among the changes, business visitor employees will be able to undertake corporate training in the UK delivered by an external company or do a short course of study. International students will be able to take up corporate internships after completing their degree. The government says it will also be made easier for graduate entrepreneurs to take up skilled jobs. Mr Harper said: "The UK is open for business. We are building an immigration system that works in the national interest and supports growth. "Today's changes will ensure that the UK continues to attract global talent to work for British businesses and study at our world-class universities. "Immigration reform is working. We have tightened immigration routes where abuse was rife while still encouraging the brightest and the best to come to the UK." Changes to the general visit visa will enable tourists to complete training courses in topics such as English and leisure activities. It will become easier for Arts Council-endorsed artists "with exceptional promise" to come to the UK to work rather than just those who have established themselves globally. Mr Harper also confirmed that rules will be adjusted to allow interpreters and other staff who helped British forces in Afghanistan to relocate to the UK. The defence secretary announced the change in May.